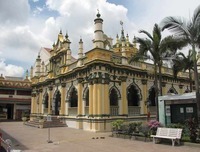 The image shows Masjid Abdul Gaffoor. Adopting a new management system can’t happen unless executives change their daily work and change how they manage. increasing the number of high paying jobs in IM – focus on health care is good (I more could be done there I would try), finance is another good target, manufacturing is decent but I seriously doubt IM will have huge numbers of high paying/high skilled manufacturing jobs (some yes, but limited). I would also target high tech, software development etc. I would work closely with organizations in Singapore and KL. I would focus a significant amount of effort on this area). Education is good (and worthily of continued effort) but provides limited high paying jobs. Not getting drunk at bars likely proactively addresses a significant portion of issues. Second, if you are coming from the USA or many other fairly high personal crime countries there are many places you are much safer while traveling. If you are coming from Japan, Singapore, Scandinavia you probably are much more likely to be the victim of crime than at home. The biggest concern in a new environment is that you don't pick up on the clues of danger that you would in your home environment. Even with the challenges created by the culture in Washington DC against non-European foreigners the last 15 years Silicon Valley continues to prosper due to the talents of a pool of global science and engineering talent. Other countries continue to fumble the opportunity provided by the USA’s policies (largely a combination of security theater thinking and a lack of scientific literacy); and the strength of Silicon Valley’s ecosystem has proven resilient. I have long thought the binary retirement system we have primarily used is less than ideal. It would be better to transition from full time work to part time work to retirement as people move into retirement. The anti-liberty policies of those we elect continues. They continue to sell out basic rights to provide favors for those giving them lots of cash. The extent to which our elected officials go to hide their actions from public scrutiny is despicable. But the real damage is the consistent march to reduce liberty while providing favors for those providing politicians cash. The damage to society by this consistent pattern is enormous. A Deming based organization uses evidence based management practices to understand the value customers receive and the variation in the delivery of that value. Internally the organization uses in process measures to monitor and improve (through experimentation – PDSA cycle) internal processes. The focus goes beyond pleasing the customer you are faced with at any one time in the Deming context. The Deming management system is designed to learn all we can from every customer interaction to improve the process of delivering value to all future customers. Software testers should be test pilots. Too many people think software testing is the pre-flight checklist an airline pilot uses. Checklists are extremely useful in software development. And using checklist-type automated tests is a valuable part of maintaining and developing software. But those pass-fail tests are equivalent to checklists - they provide a standardized way to check that planned checks pass. They are not equivalent to thoughtful testing by a software testing professional. Accepting risk doesn't mean failure is good. And it doesn't mean the results of experiments are all blameless. You can do a poor job of taking risks. If that is done, we should learn from it and improve how we take risks going forward. 3) hide extremely bad policy (and most likely lots of illegal activity) behind claims of "national security"
The whole idea that process improvement efforts are harmful to innovation frustrates me. It is due to misunderstanding what is labeled as process improvement. Lean isn't about just making whatever process exists less wasteful. Lean focuses on value added to customers but people forget that. Yes a think tank or research lab would not be served well by the same types of processes as a fast food restaurant. And a fast food restaurant wouldn't be served by the type of process improvement that would benefits a research lab.